Snowmelt is an integral component of the hydrologic forecasting process in many parts of the world. Here, we examine the influences of environmental conditions on snowfall distribution, snowpack structure, snowpack-environment energy exchange, and finally, the rate and amount of snowmelt itself. The fate of snowmelt water after it reaches the ground is also explored. I enjoyed learning this module.very useful. Each and every topic was not only to increase knowledge in respect to your job field but it was also interesting to everyone, either it was relevant or not because forecast topics might not be relevant to civil engineer which are working in PWD/Irrigation deptt. So over all it was good experience for me to join DLP in hydrology. Concepts have been explained in simple steps. Excellent. this is on the job training, as well as educational. Presented fairly well. Explanations at some places could have been made more lucid. Animations may be included (:D). Explain the influences of terrain, wind, vegetation, and temperature. Describe how sublimation affects snowpack. 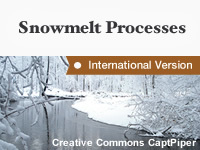 Describe the process of snow metamorphism. Describe why and how snow energy exchanges are important. Explain the importance of latent heat exchange. Describe what is necessary for rapid melting. Explain the importance of rainfall on the snowmelt process. Describe how water can move through the snowpack. Explain what happens when melt water reaches the ground surface.